In 2013, our consultants—based in nine different offices nationwide—completed more than 100 market analyses related to master-planned communities. Florida active adult community plan retains its #1 rank. Once again, The Villages in central Florida led with 3,419 net new home sales in 2013—20% increase over 2012. Lesley Deutch, Senior Vice President, reports that many active adult communities all over the country had an excellent year in 2013 due to great demographics, a strong stock market, and well qualified buyers with no legacy mortgage issues who found it easier to sell their existing home. Lesley Deutch leads our Florida office. Lesley also points out that Lakewood Ranch in Sarasota benefits from a strong retiree buyer component that is complemented by a diverse group of family buyers. Lakewood Ranch’s unique combination of public and private builders has helped secure its recent success. A sharp increase in active adult demand statewide has also benefitted Del Webb within its Nocatee’s Riverwood neighborhood in the Nocatee masterplan in Ponte Vedra (Jacksonville), Florida. 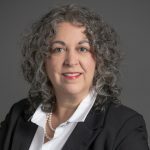 But Nocatee is much more than an active adult community, notes David Kalosis, Senior Vice President in our Atlanta office. 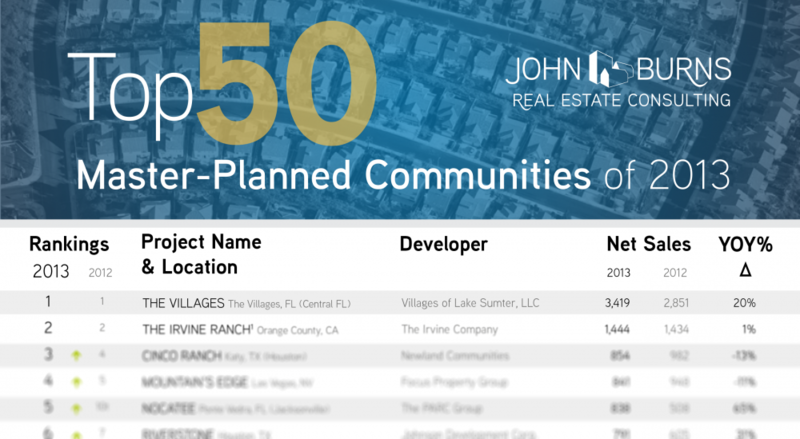 The fastest growing among the top 10 MPCs in our survey, Nocatee remains the top-ranked masterplan in northeast Florida. As employment and housing demand has shifted decidedly south into St. Johns County, Nocatee has become central to that growth, offering excellent schools and easy access to area beaches. Product and pricing adjustments have repositioned Nocatee to reach more area families. Cane Bay Plantation is a Southern success. Top-selling masterplans in the South are not just limited to Florida, David Kalosis reminds us. Sales at Cane Bay Plantation are up nearly 60% this year, driven by soaring active adult demand among its anchor tenant, Del Webb Charleston. The Summerville area continues to be the core submarket for Charleston’s housing demand, which also benefits Pulte’s Centex brand, Lennar Homes, and newcomer Dan Ryan Builders within the Cane Bay masterplan. Despite limited land supplies, the nation’s capital is well represented. Three of the best-selling master-planned communities in our top 50 list are located in Loudoun County, Virginia—a little more than 30 miles west of downtown Washington, DC. One Loudoun, Brambleton, and Stone Ridge are perfectly positioned to attract commuters to the growing employment centers in Fairfax County, Arlington County, and Washington, DC, reports Dan Fulton, Senior Vice President in our DC office. Low inventory of existing homes for sale, good schools, walkable neighborhoods, and impressive amenities drive buyers to these top sellers. Although the communities compete in the same submarket, they actually complement each other with unique product lines, amenities, and themes that attract a variety of consumer segments. A special mention and congratulations go to Miller & Smith/North American Sekisui House, LLC, developers of One Loudoun. 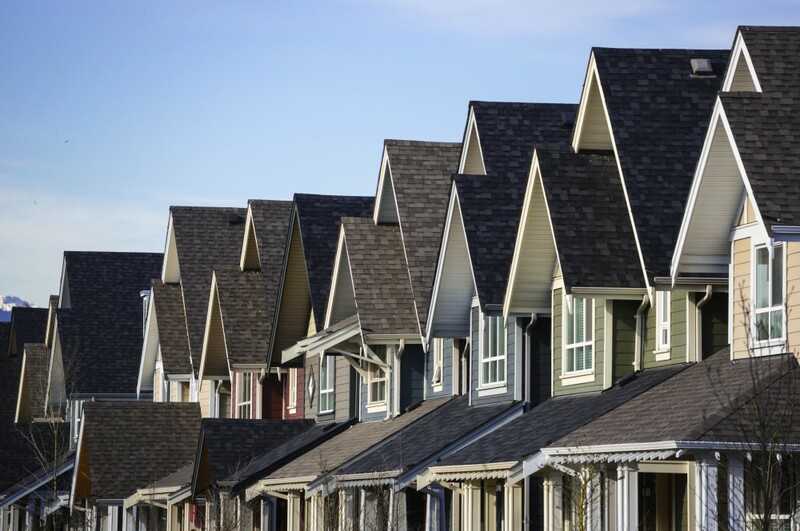 The 224 new home sales at One Loudoun in 2013 represented an astounding 224% increase over last year’s total, the largest year-over-year improvement of any community in our survey. Foreign buyers drive The Irvine Ranch’s #2 rank. The Irvine Ranch in Orange County, California retains the second spot in our ranking with 1,444 net new home sales—consistent with last year’s strong showing. Buoyed by strong local economies and a great exchange rate, Asian buyers (excluding East Indian) comprised 53% of new home sales in Irvine. Schools were the number one attraction. Rancho Mission Viejo is a new breed of master-planned community in Orange County. Irvine Ranch isn’t the only Orange County masterplan that merits mention in 2013. Pete Reeb, Senior Vice President in San Diego, notes that Rancho Mission Viejo in San Juan Capistrano is uniquely incorporating both primary home and age-qualified villages into one cohesive community. Both villages offer multiple product lines including attached and detached for-sale programs, and the community offers extensive recreational opportunities. Both villages share a common recreation center, while the age-qualified village has a second exclusive clubhouse facility just for AQ residents. Even with higher HOA dues and higher prices than the primary housing, the age-qualified projects are selling out every phase release off of long waiting lists (the primary housing is selling quite well, too). Careful market segmentation by density / lot size, home size, and life stage has translated into maximization of sales there. Mountain House by Shea Homes north of Tracy, California, came roaring back starting in 2012 and had another great year in 2013. A variety of neighborhood types and price points combines with great schools and a “there there” (sense of place) to attract buyers priced out of closer-in locales in the Bay Area, notes Dean Wehrli, Vice President in Northern California. Family-friendly detached homes in places like Dublin in the East Bay are priced from about $800,000 to well over $1 million—- at times more than double the price of the same house in Mountain House. Drawing from primarily family households in the jobs-rich Silicon Valley as well as the East Bay, Mountain House has sold nearly 300 homes annually two years in a row, Dean said. Remember, great execution and thorough research build great master-planned communities. 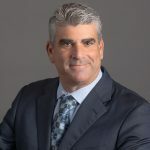 San Diego-based Senior Vice President Ken Perlman worked on more than 20 master-planned community studies across 10 different states and more than a dozen metro areas in 2013. He found that despite the market, great masterplans boil down to great execution. Newland Communities developed five masterplans in this year’s top 50 including Cinco Ranch in Houston, the community with the third most sales in our survey (854). Builders in Cinco Ranch maintained strong pricing power because the community had been so well executed, with the developer closely monitoring builder product segmentation (and strictly adhering to it), buyer profiles, and appropriate amenities. The little things matter as much as the big things. Each year JBREC conducts a proprietary survey of over 20,000 consumers nationally. Prospects indicate that amenities such as a pool and a clubhouse are nice to have but that ultimately masterplans need to have a “personality.” Understanding your buyers and creating connectivity for your communities through planned and organic activities and amenities create a sense of place and make a masterplan a “community”. Contact Ken Perlman (858) 558-8384 x 151 or Jody Kahn (603) 235-5760 for more information.